It’s so cheap that it’s hard to believe it’ll be any good, but what makes the new Ainovo-branded NOVO7 tablet from Ingenic and MIPS notable is the fact that it’s the world’s first tablet to run the latest Android OS, Ice Cream Sandwich. Retailing at $99, the device is only available in China for the moment, though should be coming to the US and other countries “in the next several months,” according to a statement issued by MIPS Technologies on Monday. 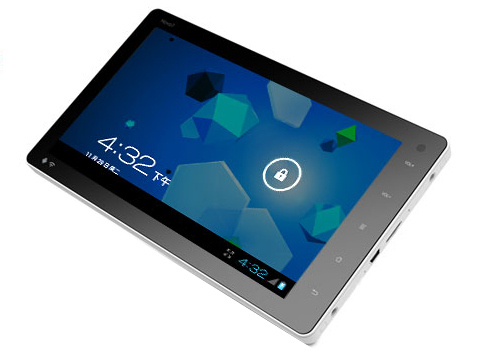 The NOVO7 sports a 7-inch capacitive multi-touch screen, with 8- and 9-inch form factors reportedly coming soon. It’s powered by a 1GHz single-core MIPS processor, has 4GB storage and includes support for Wi-Fi 802.11 b/g/n. The device has ports for USB 2.0, HDMI 1.3 and microSD, is capable of 1080p video decoding and is equipped with dual front/rear cameras. Battery life comes in at around seven hours for general use. For those in the US who wouldn’t mind trying out the device sooner rather than later, it can be ordered online, though you’ll need to be prepared to fork out more than half the cost of the tablet to have the thing shipped. Ainovo is definitely stealing a march on all the other tablet producers with the release of the NOVO7, and at such a low price it’s going to attract interest from those looking for a dirt cheap tablet. As the saying goes, you get what you pay for, but in this case it’s just possible you might be getting a little more.